I can't recall a season with more more simple, clean skirts and tops made in leather, or with significant leather details. The drawback to mixed fabric and leather pieces is obvious: specialty drycleaning. But, since nearly all are dark, they often need only a light wipe with leather conditioner. (I've only ever cleaned leather skirts that way for years, then finish with a swoosh of protector spray.) Wearing a cami under tops helps, too– but ultimately, there are pros who can return your piece all clean. Phillip Lim combines leather and silk in a top; it can give you that Marianne Faithfull (sober, but still dangerous) vibe. Price, $745. 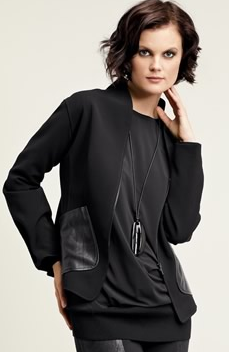 Danier, the Canadian mall chain, is mostly average, but every fall for the past three years they have slid in some simple, strict pieces. This year's entry is a bamboo stretch jersey and lamb leather sleeved top, available up to L (will fit 14-16, a lot of stretch in the piece) on the web site. (I have a similar one and wear it every chance I get.) Price is a grab-able $249. Lafayette also make a lined travel-worthy jacket in tech cloth with leather patch pockets, the perfect layer for Portland or Prague. Price, $598, and available in women's, petite and plus. On your behalf, I've checked out dozens of leather skirts. Most are too short for women over 50, unless you want that Hey, Sailor effect. 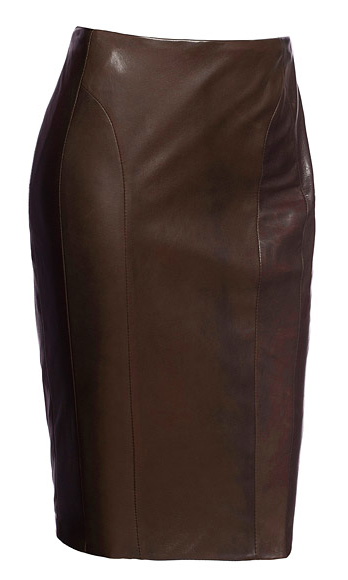 The winner for quality, price and cut is the "weightless lambskin" Lafayette 148 slim skirt. Big smudgy red lipstick kiss to them for offering it in plus (as well as regular and petites) and in a 24-inch length in women's and plus, 20 inches in petites. Price, $728; also comes in espresso, but can you imagine how the vermilion would make you feel in drab winter? Runner-up: Danier classic pencil (Style # 113030099); though length is not given, you can tell it's not a mini. Price, $279 in espresso or black. A leather skirt is stellar, rollable travel piece, dressier than jeans and, worn with a jacket or sweater, goes to most work settings, especially if not in the tougher black. If you can wear a 4 or 6 and seek a slinky departure from basics, Danier's site has a sale item, a python-printed leather skirt that would certainly jazz up a cashmere tee, no? Sale price, $119. When I think of it, leather items are always among the lowest cost-per-wear and longest shelf life in my wardrobe, not that you will need that rationale if you fall in love with a simple, light piece! I've been thinking about leather for fall/winter myself -- if I can find a piece that's soft enough to sew with on a non-commercial machine, I want to make a leather/wool jersey top using the Hot Patterns shift pattern I used for the blue linen dress this summer. Since it's got four pieces front and back, I have lots of placement options. And that red leather skirt! Vroom, vroom! Great picks as always, Duchesse! Because I like to push up long sleeves, I'd probably prefer the leather on the body of the shirt rather than the sleeves, so I'd gravitate toward the Lafayette there too. Every since you posted about that leather tee I've been on the lookout for one, no luck yet. always, for a smart post. Never been a leather fan, but you sure have picked some lovely pieces. Personally, I am more enamored of your ring in your wonderful new self-portrait! I would like a leather tee, such as you say you wear. But I confess to not like leather details much. Somehow they seem, um, cheesier? While full leather rocks. I'd love to see you wearing your leather top. I shy away from leather as I find I am too warm when I wear it. My sister has oodles of it and on her it looks divine. I think I am more of a cashmere gal. Ooooh! Last fall, I bought a Club Monaco faux-leather pencil skirt after years of keeping an eye out for the real thing in a length I could wear. The faux is decent quality and fun and has proved to me that I would wear the real thing, even at my age. It's been years since I've had one I loved, but that Lafayette almost looks worth trying the online ordering (not my thing -- although I have ordered once from Bompard). 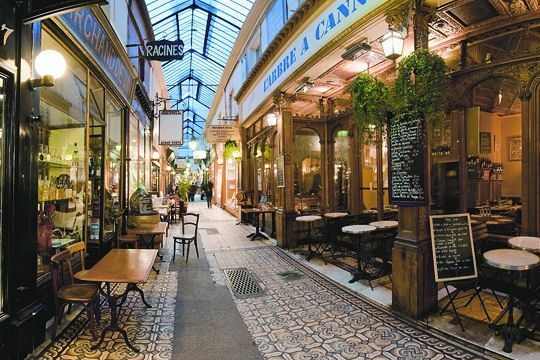 And perhaps stepping into Danier to see how theirs fits, although probably better to hold out for that Lafayette weight, which sounds luscious. You've shown us a very nice assortment here, Duchesse. Leather and September do seem to go together. I'm drawn to the asymmetrical cut of the Lafayette sweater, and the clever seaming of the Danier espresso skirt, but I think I've already found my leather pieces for this season: a slouchy second-hand Dana Buchman petite black wool military-blouse-style jacket with soft leather collar, cuffs & trim; a thrift-shop leather skirt (original tags still on) in a mood-altering cerulean blue; and a great new Banana Republic charcoal knit dress with just a touch of leather at the clasp of the belt. Oh--and more Italian boots, of course! rubi: If you make it, please show us! Pseu: To keep your Paris jacket company ;)? Caryl: I too had an agnes b. leather jacket, wore for years, till 'outgrew'. Dang. Gretchen: the ring was a surprise, am loving it! LPC: In the hands of someone like Jason Wu, do not find cheesy, but then I like leather full or as trim. 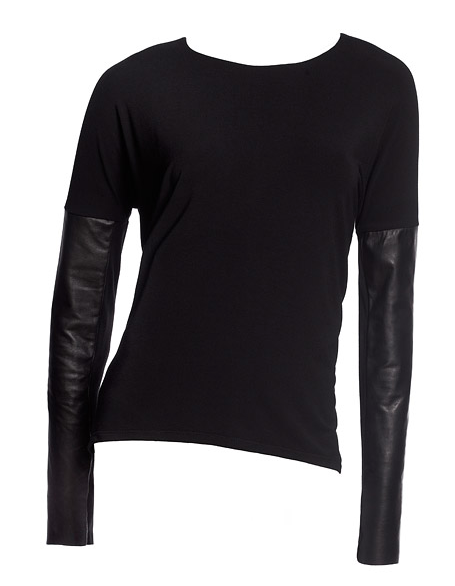 hostess: Leather can be warm but thinner skins are not hot, nor is a piece like my tee, which has only a leather front. ma: I think pleather is great, and it has fooled me! C: Ohhh would I love to see that cerulean skirt! (Too bad can't post photos in comments.) Once again, secondhand triumphs. 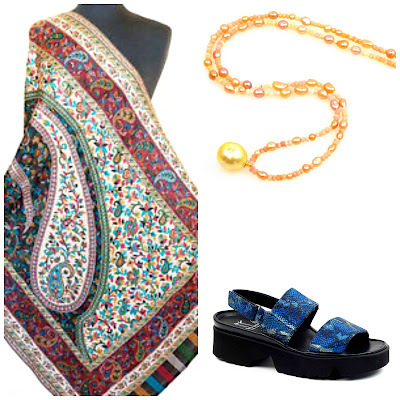 chicatanyage: It does pick up a 'classic' wardrobe; still recall a black wool coat that had a collar lined in heliotrope leather, worn by a friend's mother. 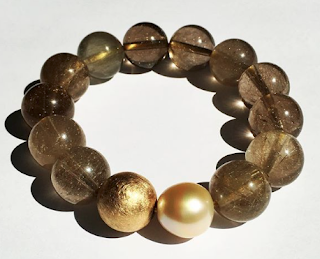 This is a brilliant post, thank you for sharing your picks! 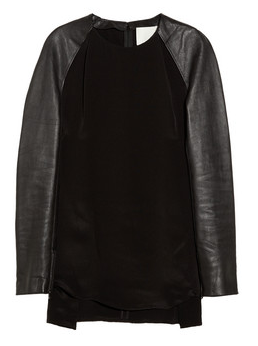 I am obsessing about leather this season - it really speaks to my fondness for minimalism. I recently bought a chocolate brown leather A-line skirt from Banana Republic (during their 40% off one item Wednesday sales) and I'm super pleased with it. 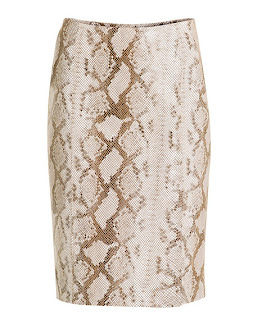 The A-line shape gives it a slightly softer look than a leather pencil skirt. 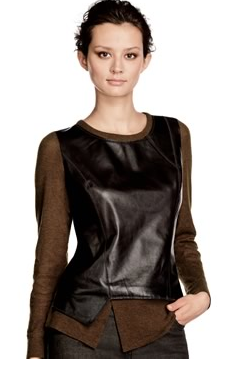 I love that Layfayette 148 leather front sweater but the color is not for me. I too am considering sewing something up mixing jersey and leather. That red leather skirt is tempting though. Louise: YoOu got a bargain; I always have some kind of leather skirt, so wearable in our climate. mardel: That's the combo on my leather tee, leather front and sleeves, heavy jersey back. But that sounds heavy for your location, or am I imagining it warmer than it actually is there? materfamilias: Have now seen the Danier skirt in person, it's as heavy as anyone would want and nicely cut, supple lambskin. I thought about this, hard, for approximately 45 seconds, after which I felt perfectly content to pass on this trend. It looks cool but seems completely impractical to me. sisty: My leather skirts have always bee among the most practical items in my wardrobe- durable, versatile and travel well. I simply wipe them occasionally with leather cleaner cream, and again with leather conditioner before storing. Some of the trim-only pieces do require a a drycleaner who can handle leathers and suedes.